Earth Day, newly implemented safety exchange zone and the remodeling of a police trailer are topics Mayor Joann Gattinelli discusses this week. 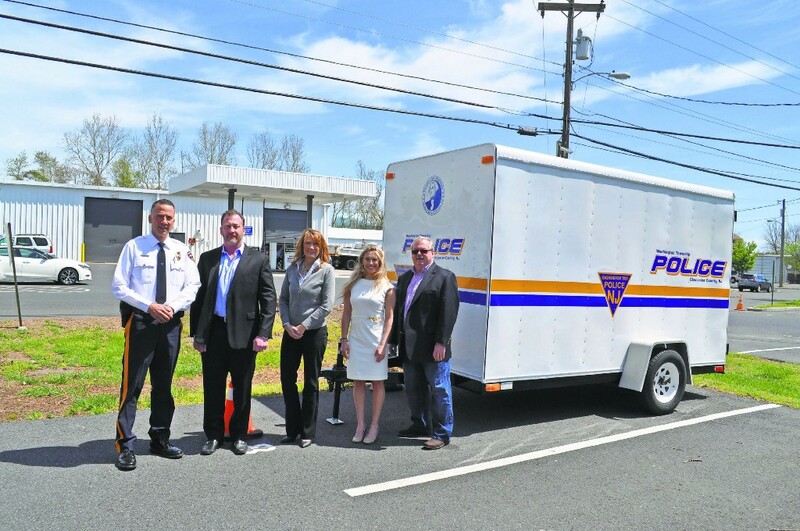 The police department’s trailer was recently renovated to uphold “high standards and level of conduct,” Business Administrator Jason Gonter said. Pictured from left are Chief of Police Patrick Gurcsik, Gonter, Mayor Joann Gattinelli, Councilwoman Dana Pasqualone and Councilman Joseph Perry. In celebration of Earth Day, I am happy to announce there are several events coming up soon. The Washington Township Environmental Commission has organized two events in addition to the Build-a-Birdhouse event that took place on Earth Day, Saturday, April 22. The Margaret E. Heggan Free Public Library is hosting a “Creating a Backyard Habitat” workshop to present tips on how to make gardens a welcoming environment for butterflies and birds, which goes hand-in-hand with the Earth Day birdhouse activity. This workshop will be held Wednesday, April 26 at 7 p.m. The second presentation is the “Night Hunters of the Sky” workshop. This event will be held on Sunday, April 30 at 1:30 p.m. The Woodford Cedar Run Wildlife Refuge will be giving the presentation, along with some live owls. I am happy we have these types of events that are kid- and family-friendly, while still allowing them to learn about the environment and the wildlife that makes up our ecosystem. In addition to the new veterans’ parking spaces presented last week, we have also established a Washington Township safe zone located in the parking lot of the police station. We came up with the idea of establishing a safe meeting place to further enhance public safety for our residents. I can appreciate having a safe space when meeting someone for the first time, or under less-than-ideal circumstances. With e-commerce on the rise, this allows people to safely exchange goods purchased via the Internet, knowing this area is under surveillance by our Washington Township police. The safe zone will also accommodate parents participating in custody drop-offs. I have been working with our chief of police to renovate the police department’s traffic trailer, which holds police equipment and is used at several public events. We believe it is of the utmost importance for the Washington Township police to have up-to-date equipment and be presented in the most professional light possible. The traffic trailer is over more than 20 years old and was in very poor condition. Because careful use of taxpayer monies is our priority, we found a cost-efficient solution and locally repainted and sanded the trailer wheels, frame and body to replace the faded paint and decals. Our public works department refurbished mechanical parts and installed new LED lights. Also, for a very low cost, a vendor was able to provide us with new reflective graphics. This trailer will be featured at the Fourth of July parade and will be a productive asset for the Washington Township Police Department.